"This is what we make in the fall when pumpkin is plentiful. It makes a good morning or afternoon snack at our house. If you don't have plain yogurt, you can substitute vanilla yogurt and omit the brown sugar." Blend banana, strawberries, milk, yogurt, pumpkin puree, peanut butter, brown sugar, 1/4 teaspoon cinnamon, and nutmeg in a blender until smooth; add ice cubes and again blend until smooth. 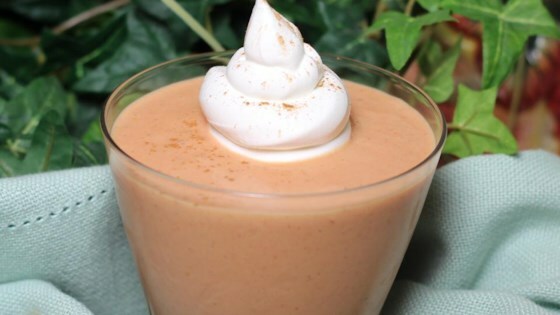 Pour smoothie into 4 glasses and top with whipped cream and a pinch of cinnamon. A refreshing smoothie, perfect for breakfast or snack-time. I'm sorry, this just wasn't a hit in this house. I followed the recipe exactly, but I didn't care for the combination of peanut butter, strawberries, and pumpkin.